Soft Power is not taken lightly by the Islamic Republic of Iran. Even if Iranian authorities extinguish independent or critical domestic media, they have launched an international English language news network that broadcasts 24 hours a day. “Press Tv was born out of the need to break the global media stranglehold of Western outlets. Press TV would be an occasion to develop for all people around the world the ideals of the late Imam, the great ideas of our great leader Ayatollah Ali Khaminai and the new outlooks of our beloved president Ahmadi Najjad” declared the Director General of the Islamic Republic of Iran Broadcaster, Ezzatollah Zarqami, during the inauguration ceremony of the network. 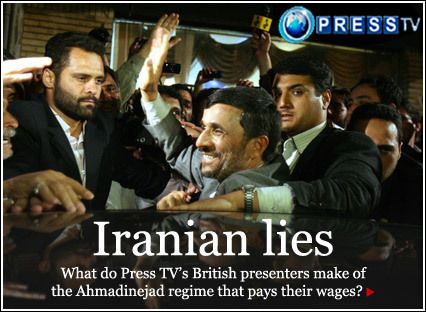 What Mr Zarqami failed to mention though is that Press Tv is a State owned, IRGC funded, Khomeini controlled network. For the readers who are not familiar with the modus operandi of the Islamic Revolution, it is worth bearing in mind that the Teheran junta fixes elections, persecutes religious minorities and murders homosexuals; it funds utterly bonkers extremist groups such as Hamas and Hezbollah and various organizations responsible for terrorist attacks and mass murder in many parts of the world. Operating in such a loaded environment, I wasn’t surprised when I watched Press Tv and visited their website of how they blatantly turn factual news from competitive outlets into news pieces tailored to fit Khaminai’s policies and how they clumsily make up facts to support their version of the news propaganda. For instance, the blogosphere relate a story that during the Green Revolution in Iran, Mr Zarqami, himself a former Republican Guard officer, attacked the “bias western media” on July 2009 and launched a smear campaign against BBC and CNN claiming that the Youtube videos of activist Neda Agha Soltan’s death during the protests were “all fake and produced by Western Intelligence Services”. Arguably, western media might have exaggerated to some extent the revolution’s impact on the Iranian society. And since we are living in a world colored by shades of grey, almost every moral assertion is debatable and every truth can be someone else’s “conspiracy”. But when it comes to Press Tv, the “C word” is the lynchpin of the network. In no coincidence, every – and I’m choosing my words carefully – piece of news in the beltway contradicting the foreign policy of Iran is deemed to be a scheme of some sort, only visible to the brave and alert Press Tv reporters employed at different locations worldwide, including Washington, New York, London, Beirut, Damascus, Bahrain, Istanbul, al Basra, Jerusalem and many other strategic cities in the world. As one might expect, Press Tv didn’t take long after their launching date before getting sanctioned for their unethical journalism. In 2010 the International Commission for Human Rights in Iran identified Press TV as being part of the Iranian regime’s intelligence apparatus and as a collaborator with human rights violators for publicizing forced confessions of dissidents. By January 2011, this propaganda arm of the Iranian government has had its British bank account frozen. Furthermore, in May 2011, Ofcom, the regulatory authority for the telecommunication industries in the United Kingdom, ruled that Press TV was responsible for a serious breach of UK broadcasting rules and could face a fine for airing an interview with Maziar Bahari, the Newsweek journalist arrested covering the Iranian presidential election in 2009, that was obtained by force while he was held in a Teheran jail. Again, upon the release of Ofcom’s findings, Mr Zarqami launched a smear campaign against Bahari and Ofcom. Bahari was accused of being a “an MI6 contact person” taking guidance from “The Protocols of the Learned Elders of Zion”! Another ridiculous ongoing debacle of the 24-hours news agency of government press releases is when it attempts to sway the public opinion into believing that while it’s broadcasting from an isolated country where freedom of expression is suppressed in violence, it still holds the undeniable truth about the internal affairs of the United States of America. Almost on a daily basis, news segments and articles from Press Tv claim that the current “Occupy Wall Street” movement is another child of the late Khomeini Islamic Revolution. In one online editorial, an author boasts that ‘as the situation stands, a revolution is manifestly bound to happen no matter what the consequences might be. Under the influence of the popular uprisings in the Islamic world better known as the ‘Islamic Awakening’ inspired by Iran’s revolution back in 1979, the American community has begun to wake up and has decided to carve out their own fate instead of feeling their way in the dark. Only time will now tell how much harsher the regime in the US will become in order to maintain their power.” This short sample of what features hourly on Press Tv is bound to make even the most serious of people chuckle. Comparing a civil society movement in a free and democratic country to an Islamic takeover of power that installed a bitter theocracy on its helm can only make sense in the minds of the brain-washed indoctrinated followers of the supreme leader. Most probably, it will make sense in Press Tv’s former Chief online editor, Mr Abdulrahman, an American fugitive wanted by the FBI for murdering a press aide to the late Shah of Iran in Maryland. Press TV is what is commonly referred to in the Middle East as the infamous “State Tv”: a bunch of people ordered to lie on live tv for the common good of the ruling apparatus. The regular viewer is invited to take a resilience test by watching Press Tv and measuring his tolerance for 24h crap news, in English.